A tractor beam of sorts is in the works. That tiny prick of light you see above is a speck of diamond dust trapped in the grip of a laser beam. Researchers are on their way to understanding macro and quantum physics. The researchers at the University of Rochester have submitted a paper for publication to the journal Optics Letters to describe that they were successful at capturing, levitating and holding diamond nanoparticles as small as 100 nm. Led by Nick Vamivakas, the researchers used laser trapping techniques using a highly concentrated laser beam that exerts an attractive or repulsive force against a dielectric nanoparticle. 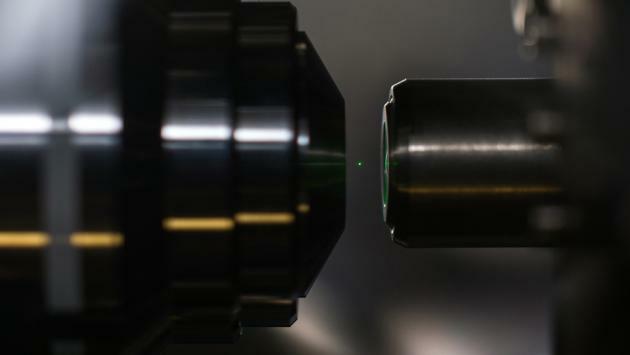 This is the first experiment to successfully pick up diamonds. The whole experiment involved spraying an aerosolized nanodiamond dust solution into a 10 inch cubic box.